With WooCommerce Product Table you can include “Quantity selector” and “Multiple add to cart” features in the Add to cart button. Quantity selector feature gives the customers a possibility to select quantities. So, they can add products directly to the cart, or click through to view the product page. 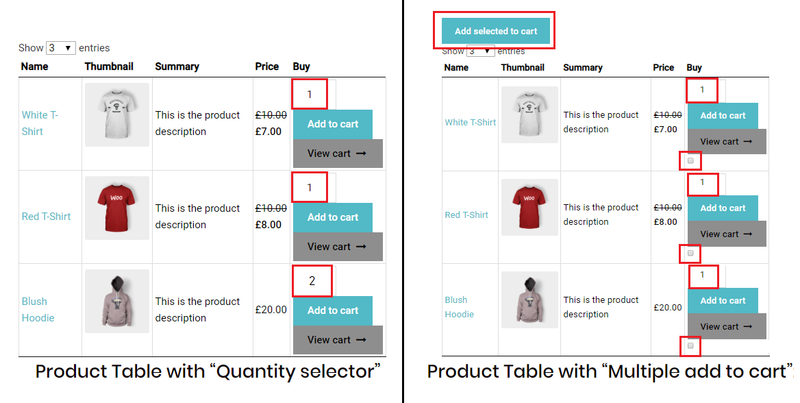 Multiple add to cart feature allows adding check-boxes to the Buy column in a table. Check-boxes allow your customers to make multiple selections. This comes in handy if you want to give your buyers a choice to pick a Quantity and add all selected items to cart in one go. Enable Multiple add to cart option. Move to the Manage Table Columns constructor. Change order or edit the title if necessary. Click the Save button and check the created table in preview mode.